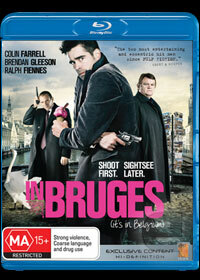 What do you get when you send two Irish hit men to Bruges? The answer is a very witty drama that stars Colin Farrell as Ray and Brendan Gleeson as Ken, two hit men who have been sent to Belgium to lie low after a hit went bad. Their boss, Harry (Ralph Fiennes) has ordered them to Bruges, a beautiful and scenic city in Belgium to play the tourist and wait patiently for his call regarding their next assignment. Unfortunately for Ray, he becomes quite bored in this town and seeks some excitement where he eventually meets a young Belgian girl who is involved in her own money making racket with her boyfriend by stealing money from tourists. Unfortunately when Ken receives the phone call from Harry, he orders him to kill Ray as he accidentally shot a child in England which goes against his own code of morals. Ken is caught between a rock and a hard place and when he refuses the assignment, Harry is on the first flight to Bruges to set things straight. In Bruges is beautifully written crime drama that is made perfect by Farrell, Gleeson and Fiennes as they all get into their roles and give their utmost performance. Fiennes is definitely the star as he plays the moralistic challenged Harry. As for Ray and Ken, although they are hired hit men, they both have their own internal norms of society such as friendships and how they must act in society which eventually becomes quite convoluted in the movie. Add in a midget and you've really got a messed up yet delightful movie. On Blu-ray, the video quality is exceptional that is matched with the cinematography of the film which boasts exceptionally sharp images, true black levels and a vibrant colour palette when used. Match that with 5.1 Dolby Digital surround and this is a true cinematic experience that makes use of the surround sound system, especially the end scene with the two on the run. In conclusion, In Bruges is drama and a comedy that is quite satisfying due to the well written dialogue, actors and the scenic locale of Bruges. With a few twists and turns, some predictable and some not, this is one movie that I could happily recommend to a variety of viewers. It should also be mentioned that the F-bomb is said quite a few times in this movie!